Atlantan Josh Arieh won his 2nd gold bracelet yesterday, claiming Event #12 of the WSOP ($2,000 Pot Limit Omaha). Josh held off Chris "Jesus" Ferguson, who was vying for his 6th bracelet, to win the title and $381,600. Jesus gets $210,460. On the final hand, Ferguson raises to $36,000 on the button. Arieh calls. With a flop of 7h-5h-2c, Arieh bets out $50,000, and Ferguson re-raises it to $200,000. Maybe because he was truly perplexed, or maybe because it’ll make great TV, Arieh stands up to think about this for a minute…then…he re-raises (seriously, doesn’t that just sound like great TV?). This puts Ferguson all-in. Ferguson calls. Arieh flips over his Kh-9d-3h-2d (giving him a pair of twos and a king-high flush draw. Ferguson’s Kd-10h-9h-3d doesn’t look too good now, because he’s drawing dead to a ten, unless he catches a runner-runner straight to split the pot. You can see where this is going. The turn (Ac) and the river (Js) do not produce a straight, and Jesus is knocked out. A great read and play by Josh gives him the title. Other notables placing in the event include: Erick Seidel (9th), Jim Bechtel (10th), Michael "The Grinder" Mizrachi (15th…and this guy is primed to win a bracelet), and John Juanda (17th). 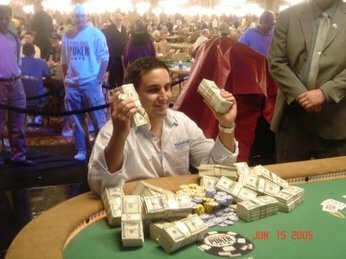 btw, josh arieh’s website… http://www.josharieh.com … has a good post from him about why he is doing well with pot limit omaha. he’s apparently been mixing it up because it’s getting harder in the NLHE tournaments to consistently win big…with the number of players, etc…so he’s diversifying. I’ve recommended this as well…the importance of learning more games and excelling at them..not just hold’em. If you’re looking to do so, Super System II is the best place to get great advice on all the games.